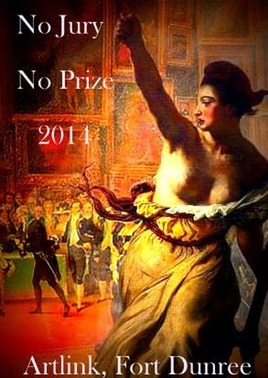 Artlink in Fort Dunree are pleased to host the 2014 No Jury No Prize exhibition. Last year’s inaugural exhibition in the London Street Gallery in Derry was very successful with almost 300 artists and art enthusiasts exhibiting their work. The exhibition is inspired by the Société des Artistes Indépendants which was founded in 1884 in Paris with the simple motto and rule – ‘No jury nor awards.’ Once again there will be no jury or prizes and all work will be accepted unless it breaches basic standards in a public gallery. The theme of the exhibition is entirely open – participants can address whatever they wish in their work. It may however be worth considering the context of the exhibition – it will be sited within the military fort on the North West coast of Ireland. Anyone can submit work. We welcome submissions from near and far. If you cannot deliver work in person you can send by post. The submissions can be in any medium – be that a drawing, a painting, a film, a photograph, a readymade, a poem or text, the documentation of a performance or happening, an installation or a sculpture. How many artworks can be submitted? Participants can only submit one artwork. Participants who wish to sell their work should also state its price. 75% will go to the artist, 12.5% to administration (hire of venue and opening event) and 12.5% to the RNLI. All work must be submitted by post or in person between 29th October and 5th November between 11am and 3pm. If submitting by post please provide packaging and the delivery cost for the return of the work should you wish us to send it back rather than collect it.